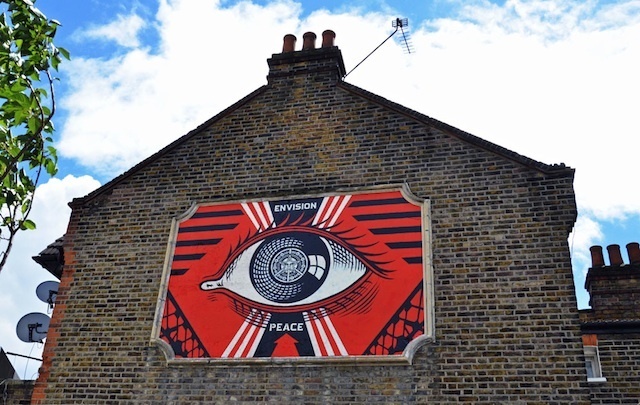 US artist Shepard Fairey's been in town, decorating a wall in Haringey. He's probably the most famous street artist in the world. Fairey's Hope poster, showing a red, white and blue Barack Obama, is already one of the iconic images of the century. He'd found fame 20 years before, under the moniker Obey, pasting up representations of wrestler Andre the Giant all over the world. Maintaining his reputation for high-profile gigs, Fairey's been hanging out in London's very own Turnpike Lane. Haringey Council and green charity Sustrans lured the American over to help improve the streetscape. His solution was to craft a giant eye inside an old Victorian niche on a shop wall. And all for no fee. While certain tabloids are probably crafting "Obey! 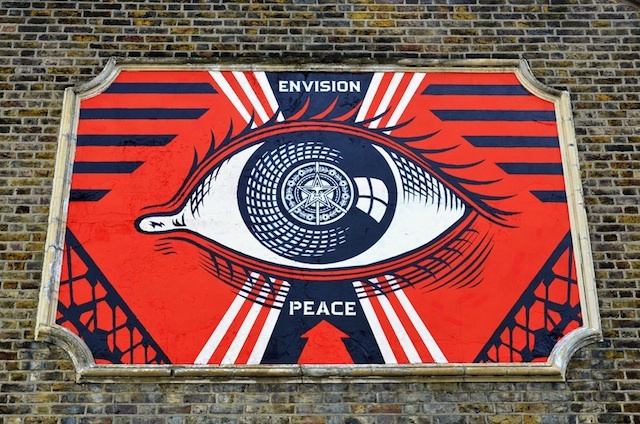 Council Installs Giant Big Brother Eye" headlines, the mural is intended as a symbol of hope, with prominent lettering imploring us to "Envision peace". And look closely at the pupil of the eye: Fairey has included his trademark Obey giant. You can find the painting behind Turnpike Lane Tube, on the corner of Langham Road and Crescent Road. The Guardian has more details. Images courtesy of Helena Martins.